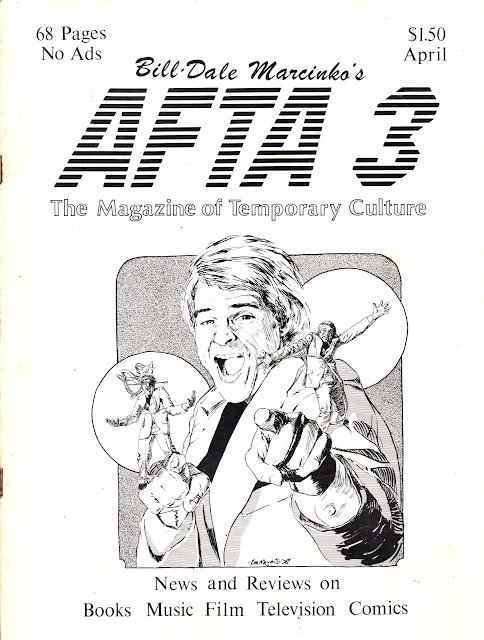 From 1979: I'd not previously encountered AFTA (brilliantly subtitled the magazine of temporary culture) before but I recently stumbled across this lone and random issue in a second hand bookstore in London. 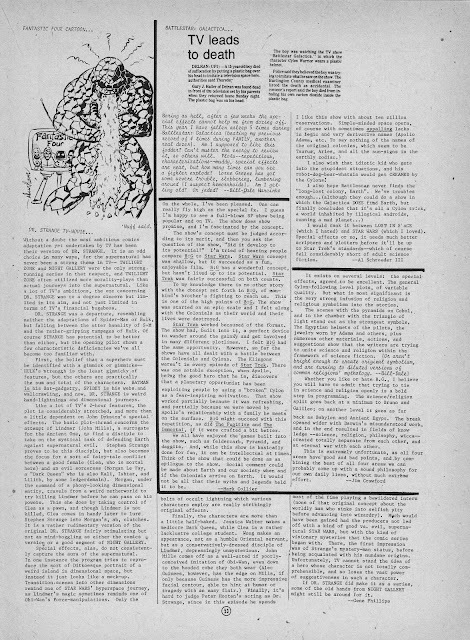 It's a fascinating (albeit challenging on the eyes) insight into US contemporary culture, but it was the reviews, and connected news clipping, for BATTLESTAR GALACTICA which I thought worth sharing. I'd not previously heard the story of the kid that suffocated on the plastic bag and the blame apportioned to Larson's space epic. It sounds a pretty tenuous connection to me as I wouldn't (and didn't) associate the Cylons with shopping bags. That would take the BATTLESTAR death toll to three. Far more widely reported (and with good reason) was the toddler that choked on the firing missile feature on Mattel's Viper toy (some contemporary sources attributed it to the Raider toy, although the description of the nose-mounted missile being like a gun seems to confirm that the Colonials were to blame). A US teenager committed suicide, by jumping from a bridge, after ABC canned the show later in '79, and blamed the network in his suicide note. This is indeed good, and most unexpected, news. It has been on my amazon wish list for a while now and I note the entry has now been updated with cover art... Although I don't know if this is a placeholder piece or the final design. Its the art from the cover of IMMORTALIS 1. And mighty fine it is too. The was one Marvel imprint (along with the ringfenced Malibu stuff) that I never thought would see the light of day again. There's some of the best UKverse work herein and its great that its getting out of the 50p boxes and into a sure to be overpriced book. It would be great if it also contained any commissioned but unpublished second wave work abandoned in the Genesis Implosion... But Marvel New York probably doesn't even know what was commissioned and completed. Presumably Marvel feel the need to reassert their ownership of the properties after all this time, hence the sudden return to print. so lorne greene was slobbering and lumbering around ? Which show was this guy watching and what drugs did he take before he wrote this review ? He didnt seem to like anything in fact. Yes slow, that reprint is one to look forward to ! Wouldn't it also be nice if they reprinted material from OVERKILL and other uk titles of the 90's ? I must admit I found the REVOLUTIONARY WAR a bit anti-climatic after the build up in your blog. And i think its notable that there hasn't been any follow-up or sequel although some of the players have appeared since in other marvel titles. For example, death's head has popped up in iron man and there have been references to mys-tech in recent issues of SHIELD.